Are you starting to think about desserts for the holiday season? It’s Natalie from Costcuisine again! 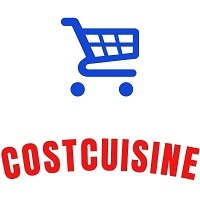 If you like Costco food reviews follow me on Instagram or Facebook and check out my blog Costcuisine where I review tons of Costco food products each week! I’m one of those people that gets sucked into the limited edition, seasonal desserts at Costco. 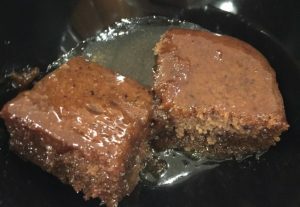 Recently I found this Sticky Toffee Pudding made by The Sticky Toffee Pudding Co. at Costco and I had to try it. The price wasn’t even posted when I grabbed it off the shelf, but I figured it was probably delicious and worth whatever the price was! The Sticky Toffee Pudding comes in a pack with two sticky toffee pudding trays for $18.99 Canadian. I have to admit that I was kind of shocked when this price came up on the screen at the register as it seemed quite high to me. The puddings aren’t overly large or heavy; each rectangular tray weighs 510 grams. After trying the Sticky Toffee Pudding, I feel that $13.99 or $14.99 would be a more reasonable price. The package says that each pudding serves six people, but if you have dessert lovers in your house, I think four is probably a more accurate number. The Sticky Toffee Pudding is very easy to warm up. You can either microwave it or put it in the oven. I chose to warm it in the oven. All I had to do was remove the plastic film on top and pop it into the oven on a baking sheet. When it was finished heating up, it cut nicely and came out of the tray easily. You can freeze the pudding or keep it in your fridge prior to making it. The package says it can be frozen for up to nine months. Nutritionally, if you eat 1/6th of the Sticky Toffee Pudding, you’re looking at 190 calories, 10 grams of fat and 20 grams of sugar. 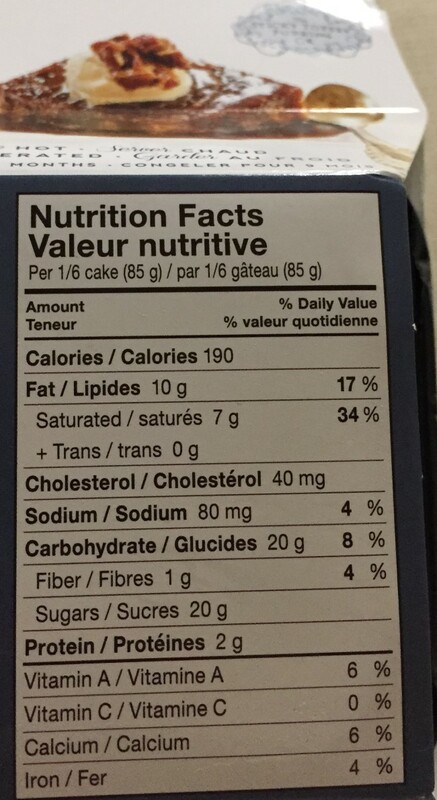 In my opinion, that’s not that bad for a dessert considering a medium pumpkin latte at Starbucks has about 380 calories, 14 grams of fat and 50 grams of sugar (I don’t know why I chose that as my comparison; I guess it’s another fall/winter comfort food?). With that being said, I can’t see eating this without either ice cream or whipped cream, so that will obviously add calories and fat. Also, if you’re like my husband and eat half the tray, you have to multiply all of those numbers by three and add the ice cream on top! 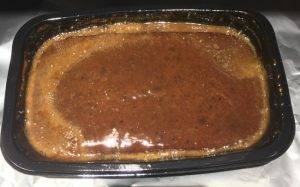 The box for the Sticky Toffee Pudding describes it as “scrumptious date cake with a buttery toffee sauce”. Once I took it out of the oven, smelled it and cut it, I couldn’t wait to sit down before trying it. The first bite I had tasted amazing. I thought, “mmmm this is so good!” The cake is a sweet, extremely moist and dense date cake. The toffee sauce tastes sweet, quite salty and very buttery, so Sticky Toffee Pudding has sweet and salty going on at the same time. 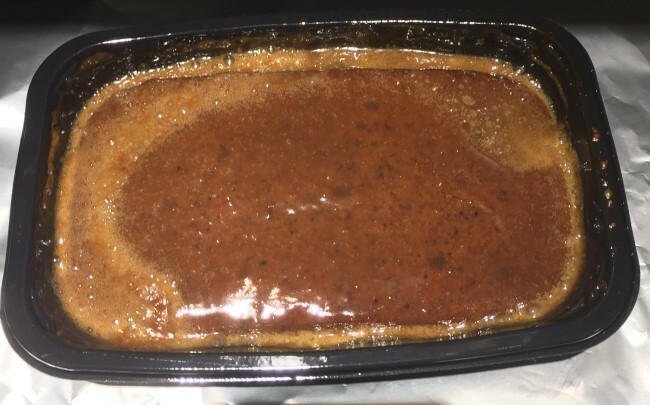 I think I made a mistake by scooping a bunch of the excess sauce from the tray onto the top of my cake, because after a few bites, I found my serving of Sticky Toffee Pudding too sweet and also too salty. This is definitely a very decadent and heavy dessert; despite the fact I have a major sweet tooth, I actually couldn’t finish the piece I cut for myself. I can’t see eating this without something to cut the sweetness such as whipped cream or vanilla ice cream. I feel like a tiny sliver would have been enough for me. It’s definitely delicious, but I have to warn those who don’t like very sweet, rich, heavy desserts that this might not be for them. My husband was easily able to eat about half the tray and absolutely loved this, but even he mentioned that he found it tasted little salty and quite rich (which wasn’t a bad thing to him). I felt due to the high price that this is definitely a splurge and probably won’t repurchase it again this year. I feel like a lot of people would probably really enjoy this and I have another tray of Sticky Toffee Pudding to use so will probably save it for when we have family or friends over so there are others to share the sweetness with. I’m curious to know if you have tried this? If not, would you try this? We bought this last year for the first time and we love cakes and sweet cakes too. It was odd, the first bite of this sticky cake was really good. Then subsequent bites just didn’t sit well with us. We quickly grew to dislike it. Rather than taking it back to Costco (which we should’ve) we stored in the freezer and eventually threw it out. Thanks Natalie for the excellent reviews on different products. I really enjoy them and appreciate that you take the time to do this. Keep well and also many thanks. That’s so kind of you to say! Thanks Donna! This is our favorite winter dessert. I buy a few packages when on sale and freeze them. I have served this to guests and family with a bit of cinnamon whipped cream or homemade eggnog ice cream. I do portion it out as recommended on the package to 6 servings per tray. Love the sweet/salty, decadence this dessert brings even after a simple meal. Thanks for sharing reviews. Have not tried this yet but will wait until it is on sale. My husband and I waited a whole year for this to return..its soo good! He loves cake..no ice cream or whip with it…and we can sit and eat the whole tray in one go (with the help of our kids too)..price is expensive..but itss soo worth it. Love this dessert and buy a couple every year to freeze and have on hand. We recently took it on a camping trip and shared it with our extended family. They loved it too and because I had some in the freezer I was able to give an extra one to my parents to take home for a dinner party they were having. Everyone really liked it! I make my own version, and it’s so easy to make – and at least half the price for double the amount of cake! Even on sale I can make it cheaper. So I wont be trying this one. But – I definately serve this with UNSWEETENED whipped cream, all of our friends go bananas over it. Even vanilla ice cream is too sweet to serve alongside.